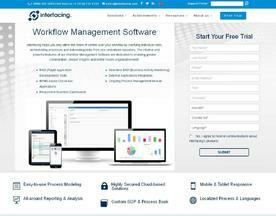 What is Online Workflow Management Software? Online Workflow Management Software is a program that automates to one degree or another the process of coordinating teams who are working on a set of tasks. The Workflow Management Software here is offered under the SaaS (Software as a Service) model, meaning that the software is web based, hosted on the Cloud and can be accessed when needed through a client or web browser. If you’re looking for similar online software like Workflow Management Software, consider our Project Management or Task Management Software categories. Stay in full control over your workflow by clarifying responsibilities and orchestrating processes using our Workflow Management tool. With intuitive interface and centralized repository, Our DBTS promotes collaboration and empowers bottom line.